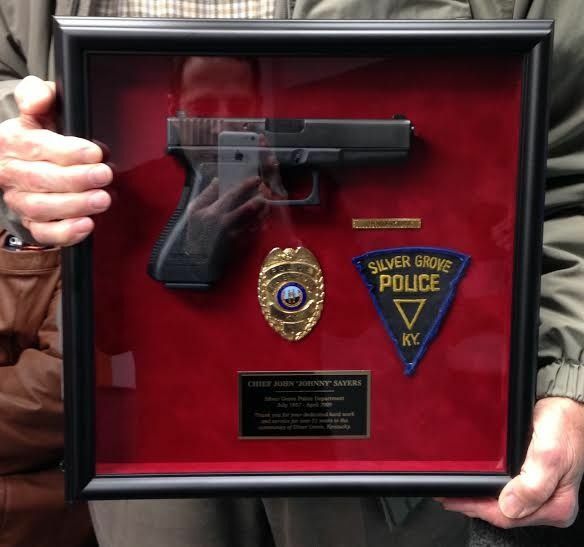 Former Silver Grove Police Chief John Sayers was recognized for his 50-plus years of service to the community at Thursday night's city council meeting. Awaiting news about its much-anticipated two sidewalk projects and the prospective grants as the meeting formally began, the city received welcome news from senior design engineer Justin Verst of Viox & Viox. Verst added that his ideal goal would have construction beginning by August but admitted that the date may be too optimistic. The second grant, which includes Route 8 heading east, has the city qualifying for an 80/20 match, which means it matches $76,000 toward the $304,000 grant from the state and can use the dollars however they choose. This grant has no specified timeline, Verst added. A new speed limit sign has recently been posted on Lindon Street, Public Works Director John Tucker told council, adding it will contribute toward alleviating the excessive speeding problem that has plagued the area. Campbell County Fire Chief Greg Buckler will be resigning but will stay in the post until his replacement is found. Council has given the go-ahead for law firm Freund, Freeze & Arnold to represent it in its lawsuit against the Sanitation District.